Even if you're going to a place where they speak the same language as you, it might not be called the same thing. In Canada we most often say "washroom" or "bathroom". In the US "restroom" is common. If it's a fancy place one might ask for the "powder room". Or you could shorten the term to "the lady's" or "the gents". In the Philippines it is "c.r." for "comfort room". The UK has a few different terms depending on where you are. Apparently "toilet" is most accepted. This sounds very crude to me but apparently the "loo" is considered more rude. "W.c." might work in some places but that seems more continental. However, if you're not sure, "toilet" does seem to get the point across in many languages! If you are travelling to a place where they speak other languages, look it up. This is a necessity if you're ever off the tourist path. Even more importantly, know how they work! Many places in the world do not have great sanitation. I know I've not seen the worst of it. This is something that you need to do a little research on and prepare yourself. Some places will have pay for use facilities. Some might have only squatty-potties. (Why yes, I HAVE peed on my sandals, thanks for asking.) Many places in Asia won't provide toilet paper or soap. I never leave home without a pack of tissues and some hand sanitizer. I once came out of a stall in Thailand and a young lady asked me if it was a "normal" toilet. Sorry, but that throne you sit on at home is not normal for the rest of the world. Again, true statements. 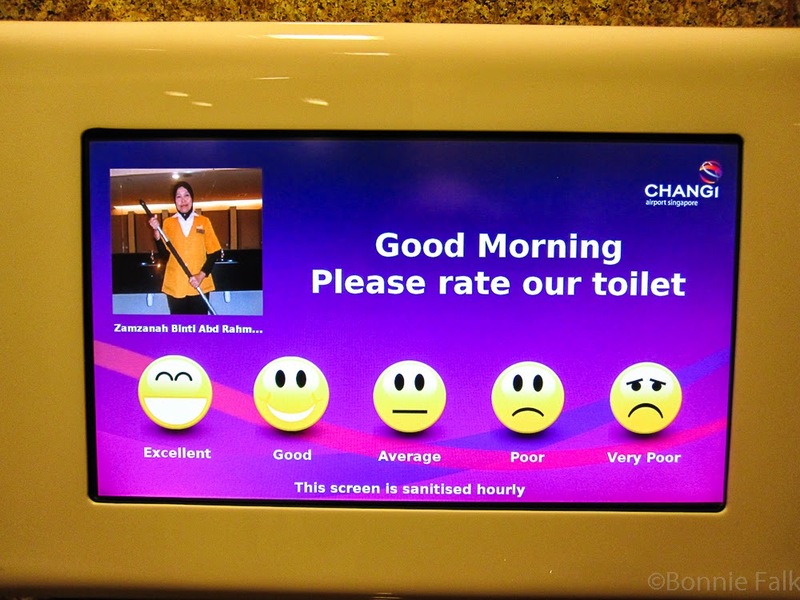 Changi is the only place I've ever been that had you rate their restrooms. You've got to love that! Changi is a special place! You are so right! This is essential information if you are off to a foreign land. Read before you go. Great post! Thank you! Yes, one needs to be informed about these things. Ha ha ha ha ha - such a good idea! Amazing how something we take for granted becomes such an ordeal when traveling. From mere holes in the ground, to stand alone pod type washrooms that clean themselves, to a swanky washroom with mirror covered walls and a television showing commercials, we've had some memorable moments using the toilet abroad :) Great "B"! Thanks! I didn't even talk about the fancy ones... totally forgot! We did come across the self-cleaning type at the Grand Casino in Monaco. Oh gosh. I've never left the country so I had no idea about any of this! My son is 3 and has only lived in Germany. Every where we go, it seems, the way to flush is different: a foot peddle, a screw to turn, a tile to push, a button... When we were in the states last year he couldn't figure out how to flush the toilet. He was looking for screws and tiles. It was pretty funny to me. I remember my first peddle flush! Some places of hoses or buckets... There is no global norm!